The mica-group mineral trilithionite often occurs in micaceous “books” of platy crystals with a distinctive lilac color. 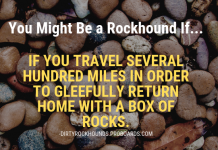 The lithium-bearing minerals most familiar to collectors are spodumene and trilithionite (formerly “lepidolite”). 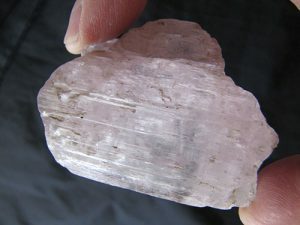 The kunzite variety of spodumene, or lithium aluminum silicate, is a gemstone with a delicate pink color; the mica-group mineral trilithionite, or potassium lithium aluminum fluorosilicate, occurs in massive form and as micaceous “books” of platy crystals with a distinctive lilac color. Spodumene and trilithionite are also ores of lithium, which is currently one of the hottest mineral commodities and an indispensable element in our high-tech world. Laptops, cell phones, digital cameras, hybrid and electric vehicles, portable power tools, and virtually everything else that uses rechargeable batteries depends on lithium. Lithium demand and prices are soaring. In 2005, a ton of lithium (as contained in lithium carbonate) sold for $2,000. Today, a ton sells for $16,000. A silvery-white, alkaline metal, lithium is so soft it can be cut with a knife. With a specific gravity of just 0.53, it is the lightest of all metals and has only half the density of water. The only elements with [less] density are hydrogen and helium. Highly reactive, lithium corrodes quickly in air and reacts violently with water. Lithium is an ideal anodic metal for electrochemical batteries. It ionizes readily, making its single outer electron available for electrical current. Lithium is far lighter than any other electrochemical-battery metal and, because lithium ions easily recombine with electrons, lithium-ion batteries are easily recharged. All these factors give lithium a very high electrochemical potential, a measurement of potential electrical energy relative to mass. In other words, a small amount of lithium can produce a lot of electrical current—exactly what is needed to manufacture small, lightweight, rechargeable batteries. Ranking 35th in crustal abundance, lithium is about as common as lead. Lithium was discovered in 1817, isolated in 1855, and first mined commercially in 1923, after it had found limited use in manufacturing glass and ceramics. By the 1960s, lithium had many new applications in lightweight alloys, lubricants (“lithium grease”), certain nuclear applications, and mood-stabilizing drugs for treating bipolar disorder, all of which remain important today. 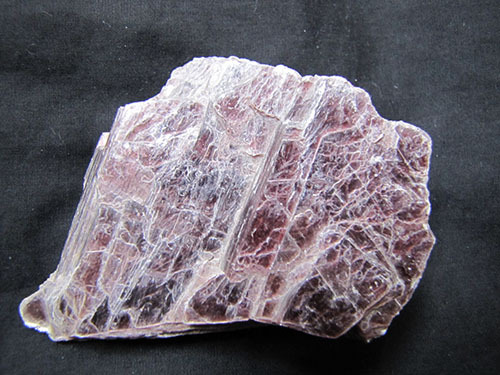 The kunzite variety of spodumene, or lithium aluminum silicate, is a gemstone with a delicate pink color. Although widely distributed and relatively abundant, lithium rarely occurs in economic concentrations. Until the 1960s, less than 1,000 tons of lithium was being mined worldwide each year. 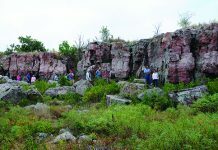 At that time, the United States dominated production by mining trilithionite, spodumene and petalite (lithium aluminum silicate) from granite pegmatites in Maine, South Dakota, North Carolina, and New Mexico. Demand for lithium grew in the late 1990s with advances in the design and manufacture of lithium-ion batteries. Annual global mine output is now nearing 40,000 tons. Today, half our lithium supply comes from pegmatite ores, and the remainder from saline brines. Australia is the leading producer, mining 12,000 tons annually from a huge spodumene deposit in Australia. Chile ranks second, obtaining 10,000 tons per year by evaporating saline brines that underlie evaporite lakebeds in the high Andes. Other important lithium sources are China and Argentina. The United States ranks fifth in annual production, recovering 3,500 tons of lithium from the Silver Peak saline-evaporation plant in Esmeralda County, Nevada. 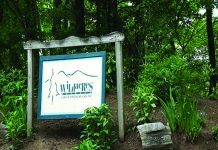 Silver Peak, owned by Albemarle US Inc., has been active since the late 1960s and is now increasing production to capitalize on soaring lithium prices. Silver Peak is currently North America’s only lithium source and one of just 14 active lithium mines in the world. 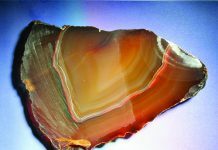 Hectorite (hydrous sodium magnesium lithium fluorosilicate) is another lithium-bearing mineral that is drawing attention. Named after the old mining camp of Hector, California, where it was discovered in 1941, hectorite forms low lithium concentrations in near-surface, montmorillonite-type clays that can be easily mined. With lithium demand and prices projected to quadruple by 2025, prospectors and geologists are flocking to the wide-open deserts of western Nevada and adjacent California—the most likely places in the nation to find new hectorite or saline sources of lithium.